The Ameren Missouri power plant is a coal burning complex just north of the town of Labadie, Missouri. The power plant has multiple bottom-ash ponds where groundwater flow needs to be controlled. 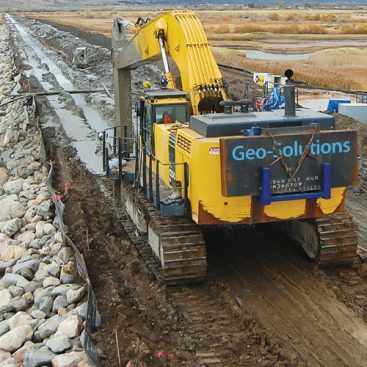 Geo-Solutions was contracted by Ameren Missouri to install a cutoff wall through one of the levees surrounding their main bottom-ash pond. This included the installation of approximately 18,000 vertical square feet of cutoff wall installed via the soil bentonite trenching method. The cutoff wall was installed from the surface of an existing access road and extended through the main pond emergency spillway. Geo-Solutions selected a Komatus PC 400 and its own custom stick to excavate to the required depth. The trench was excavated under bentonite slurry manufactured in Geo-Solutions’ on-site batch plant. Due to space constraints, backfill had to be mixed remotely. Trench spoils were trucked from the trench to a mixing area where they were blended with bentonite slurry to create a homogenous backfill mix. 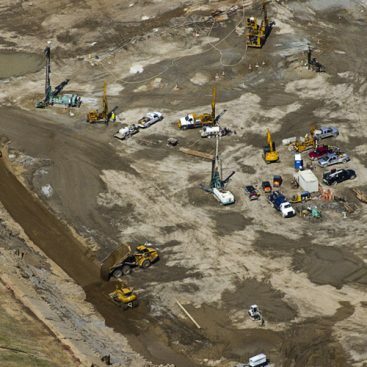 The backfill was then trucked back to the trench locations and placed in the trench to create a barrier wall which met the requirements set forth by the specifications. Installation of an impermeable clay cap.